Abstract. 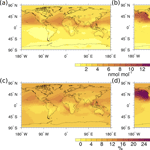 We quantify the contribution of land transport and shipping emissions to tropospheric ozone for the first time with a chemistry–climate model including an advanced tagging method (also known as source apportionment), which considers not only the emissions of nitrogen oxides (NOx, NO, and NO2), carbon monoxide (CO), and volatile organic compounds (VOC) separately, but also their non-linear interaction in producing ozone. 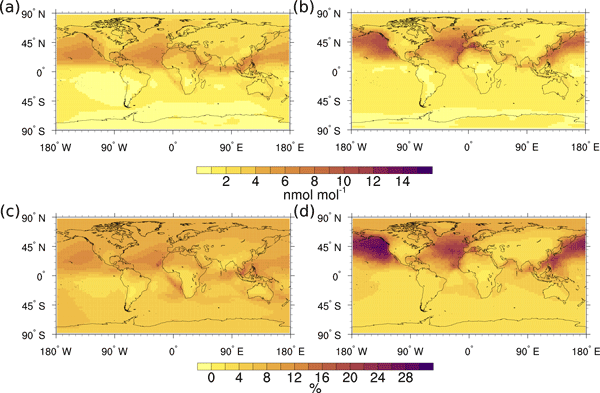 For summer conditions a contribution of land transport emissions to ground-level ozone of up to 18% in North America and Southern Europe is estimated, which corresponds to 12 and 10nmol mol−1, respectively. The simulation results indicate a contribution of shipping emissions to ground-level ozone during summer on the order of up to 30% in the North Pacific Ocean (up to 12nmol mol−1) and 20% in the North Atlantic Ocean (12nmol mol−1). With respect to the contribution to the tropospheric ozone burden, we quantified values of 8 and 6% for land transport and shipping emissions, respectively. Overall, the emissions from land transport contribute around 20% to the net ozone production near the source regions, while shipping emissions contribute up to 52% to the net ozone production in the North Pacific Ocean. To put these estimates in the context of literature values, we review previous studies. Most of them used the perturbation approach, in which the results for two simulations, one with all emissions and one with changed emissions for the source of interest, are compared. For a better comparability with these studies, we also performed additional perturbation simulations, which allow for a consistent comparison of results using the perturbation and the tagging approach. The comparison shows that the results strongly depend on the chosen methodology (tagging or perturbation approach) and on the strength of the perturbation. A more in-depth analysis for the land transport emissions reveals that the two approaches give different results, particularly in regions with large emissions (up to a factor of 4 for Europe). Our estimates of the ozone radiative forcing due to land transport and shipping emissions are, based on the tagging method, 92 and 62mW m−2, respectively. Compared to our best estimates, previously reported values using the perturbation approach are almost a factor of 2 lower, while previous estimates using NOx-only tagging are almost a factor of 2 larger. Overall our results highlight the importance of differentiating between the perturbation and the tagging approach, as they answer two different questions. In line with previous studies, we argue that only the tagging approach (or source apportionment approaches in general) can estimate the contribution of emissions, which is important to attribute emission sources to climate change and/or extreme ozone events. The perturbation approach, however, is important to investigate the effect of an emission change. To effectively assess mitigation options, both approaches should be combined. This combination allows us to track changes in the ozone production efficiency of emissions from sources which are not mitigated and shows how the ozone share caused by these unmitigated emission sources subsequently increases. How to cite: Mertens, M., Grewe, V., Rieger, V. S., and Jöckel, P.: Revisiting the contribution of land transport and shipping emissions to tropospheric ozone, Atmos. Chem. Phys., 18, 5567-5588, https://doi.org/10.5194/acp-18-5567-2018, 2018.